When Moreno and I began this journey two weeks ago, we stepped into darkness. We didn’t know who we’d find, or what they’d tell us. We merely hoped our stories and theirs would be interesting enough to draw attention to our cause. You might have wondered where the point of contact is between the issue of human trafficking and a series of portraits I took five years ago. It’s right here with our sixth subject, who returned home only this week after spending three years in Malaysia against his will. Because he’d been working abroad illegally and I didn’t have permission to use his real name, I referred to him previously by a pseudonym, Nuryadi. He’s now asked that I refer to him simply as Amak Juni, or ‘Juni’s father’. The day before we interviewed Amak Juni, we spoke with representatives of Perkumpulan Panca Karsa (PPK), an NGO that has been working with the issues of women’s development, human trafficking and child abuse here in Lombok for the past quarter-century. Lombok serves as a source, transit point and destination for human trafficking. PPK handles hundreds of cases each year, and these are only the tip of the iceberg. Poverty is the problem, and education is the solution. As a major tourist destination, many women are lured here from Java anticipating well-paid work in hotels and restaurants, only to be forced into prostitution. Similarly, local people promised positions abroad – particularly in Malaysia and the Middle East – often have their documents seized, and find themselves working under horrendous conditions. That’s precisely what happened to Amak Juni. After arriving legally in Kuala Lumpur, his passport was taken from him, and he was sent to work in a camp outside Johor Bahru, near Singapore. He was forced to work collecting palm oil for nine hours a day, seven days a week, for three years, receiving in exchange only 700,000 Indonesian rupiah – about US$61 – per month. The situation might have continued indefinitely had he not risked an illegal crossing of the straits between Malaysia and Indonesia. It took him a week to return to his village, and cost him everything he’d earned. Amak Juni had gone to Malaysia to earn money for his daughter Junita’s education. Having never attended school himself, the options in his own village were very poor ones, and these were the options his wife Salni faced in his absence. Salni has been working as a labourer, receiving only 20,000 rupiah – about US$1.75 – for each eleven-hour day spent carrying rocks and dirt in a basket on her head. Three-quarters of that money was spent directly on food, merely to keep herself and her daughter alive. This was precisely the future they’d been trying to avoid for Junita. Not prepared to risk leaving his family again, Amak Juni will try to find work again as a porter on Rinjani. 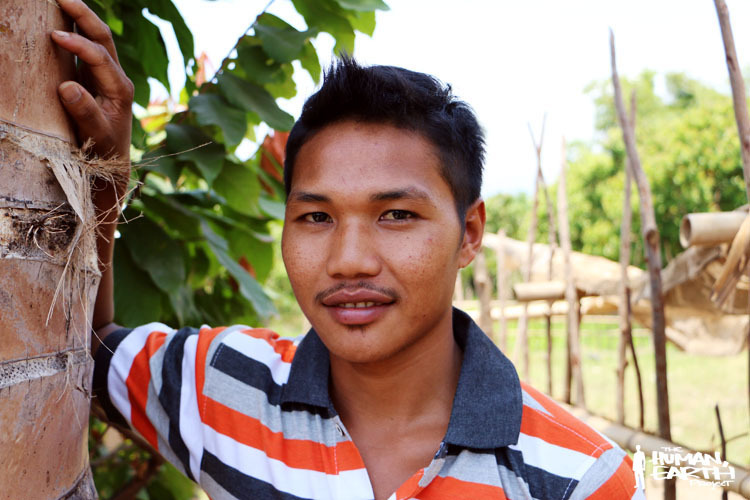 Salni will continue hauling rocks and, without the money for an education, Juni’s story would be no different. The story might have ended there, precisely where it began. What happened next, however, was beautiful beyond words. After reading my last post about Salni and Junita, and without knowing the details of Amak Juni’s experiences in Malaysia, a good friend of mine in Canada had offered to help support Juni’s education. There aren’t many things that can give you such chills beneath the tropical Indonesian sun. To hear the story of Amak Juni’s family struggling so hard for so very little, to see them staring so helplessly down the long dark barrel of a future they could no longer hope to avoid, and then to give them the news that their little girl might still dare to dream, was something that affected me very deeply as a human being. Amak Juni’s family borrowed a motorbike from another family in the village, and rode with us into town. 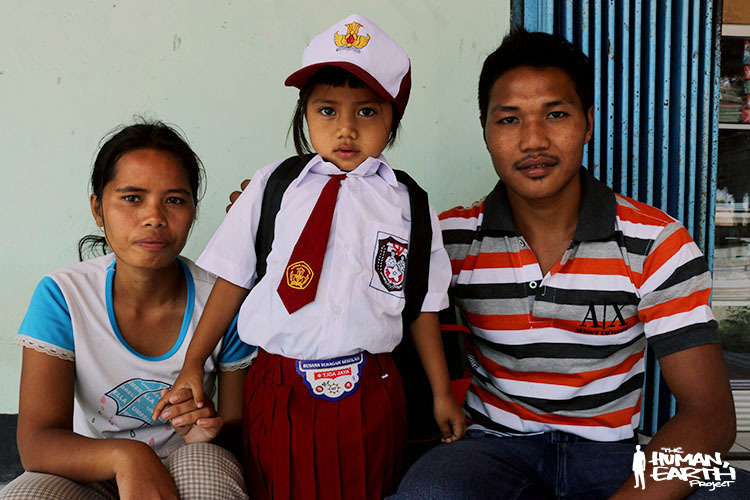 For 411,000 rupiah – only US$36 – we bought Junita two shirts, two skirts, a hat, a tie, a belt, a pair of shoes, two pairs of socks, a school bag, exercise books, pens, pencils and crayons. She’ll begin school on Monday. We’ve established a means of communication with, and of sending support to, Amak Juni’s family via PPK. My Canadian friend, who wishes to remain anonymous, will do what she can to ensure Junita finishes her education. I’d like to thank that friend, for giving hope to this beautiful family that has struggled so hard for it. I’d like to thank Amak Juni for opening a window into the vast and horrendous industry of human trafficking. I’d also like to thank my good friend Habibi, who was of immense assistance to us during our stay in Lombok. For us, this is only the beginning; there are still so many unknowns that await us on our path across Asia. Come with us, while we press on into the darkness. And please, share this with your friends, and let them know what we’re doing!